Peter Grogan’s programme “It’s All in the Song” is an hour-long proof of just that. For Peter, the lyrics are where it is at and the calibre of the artists featured, from at home and abroad, from week to week, guarantee that melodies are married seamlessly to the lyrics. But it’s not all serious stuff. Expect the unexpected, the comedy interval, the parody, the well-chosen poem and often the live studio guest. Peter is a constant concert and gig goer. This is very much reflected in his programme each Saturday at 12pm. His playlist will include singer songwriter material, folk, traditional and Americana. In fact, expect to find anything there – as Peter says himself. “if it’s good I’ll play it”. Peter’s informative links and natural, easy, humorous style of presentation all add up to a lovely programme. 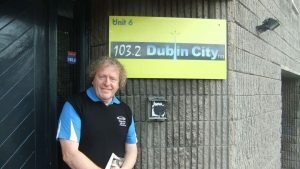 each week on 103.2 Dublin City FM for one purpose only, to prove that it’s all in the song.